Everyone in Montana appears to support a program that prevents invasive mussels, but few agree on how to pay for it. That was as evident in public comments made to a legislative committee on Monday afternoon as it was two years ago when the Aquatic Invasive Species program was created in response to a zebra mussel scare. But Rep. Willis Curdy, D-Missoula, tried to defend House Bill 32 as the proposal that the Environmental Quality Council passed 15-1 last fall. Similar to the past two years, HB 32 would give the AIS program about $6.5 million annually. Unlike the last two years, the money would be collected from three main sources: fees of $2 to $7.50 on fishing licenses, watercraft registration fees of $5 to $60, and as much as $3.3 million a year out of the state general fund. The money pays for about 50 check stations around the state that inspect thousands of boats for mussel stowaways every year. 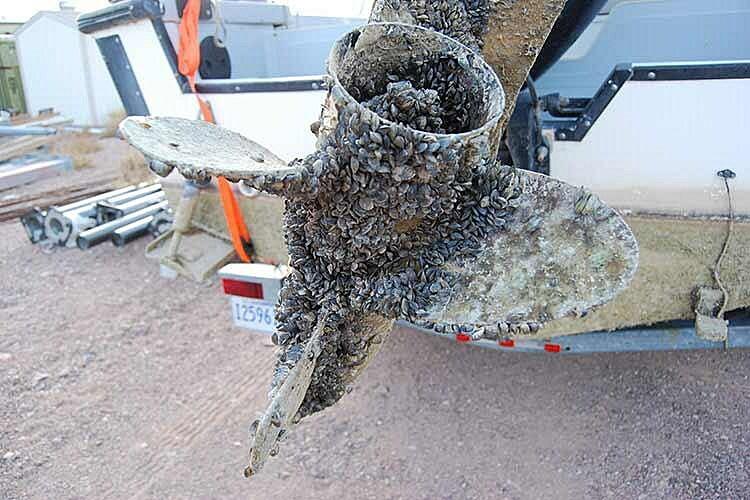 Last year, mussels were found on 16 boats, but only two belonged to Montana owners. Most of the rest were passing through to other states. The previous agreement charged fishermen and required hydropower operators to pay about $2 million a year but did not charge watercraft fees nor did it use general fund money. During public comment, 13 people, mostly representatives from the agriculture and hydropower industries, voiced support for the bill. Chairman Kerry White, R-Bozeman, said there might be a way to assess a fee to people who use surface water to irrigate. When he asked if agricultural producers could pitch in, representatives said they already pay taxes into the general fund. Jordan Thompson, spokesman for the Confederated Salish and Kootenai Tribes, said the CSKT were not only cooperating with Montana Fish Wildlife & Parks to man check stations at Ravalli and on the west side of Flathead Lake at Elmo but also contributed $300,000 of its own money to try to keep mussels out of the lake and the Flathead River. “With this bill, the funding would be more consistent. We’d like to continue to partner with (FWP) in the future, so we can protect the headwaters of the Columbia (River) and Flathead Lake,” Thompson said. The five opponents of the bill emphasized that they support the AIS program but had issues with where the money was coming from. Bob Gilbert of Walleyes Unlimited of Montana said it was easy for the agriculture and hydropower representatives to support a bill when they weren’t being asked to pay. Gilbert said he also pays taxes, but since he owns four older motorboats and buys a fishing license, he’d have to pay five additional times, under the bill. State budget director Tom Livers opposed HB 32, because Gov. Steve Bullock backed an alternative bill being introduced within a few days that would eliminate contributions from the general fund. Rep. Marilyn Marler, D-Missoula, said all the industries that could be affected by mussels should pitch in, including hydropower, which faces potential damage costs of between $10 million and $25 million a year, according to a recent study. White suggested cities and towns that depend on surface water for their water sources should also have to pitch in. White said he was considering holding onto HB 32 until he saw the governor’s bill, and then maybe the final bill would be a combination of the two. Earlier in the day, while presenting the FWP budget proposal to a joint committee, FWP Chief of Staff Paul Sihler asked legislators to allow the agency to create a $500,000 emergency-response fund. Like the fire incident account of the Department of Natural Resources and Conservation, the fund would help FWP respond to emergencies such as mussel introductions or outbreaks like chronic wasting disease or trout whirling disease. When mussels were found in Tiber Reservoir in 2016, FWP had to withdraw $80,000 from the governor’s environmental contingency account for the initial response.